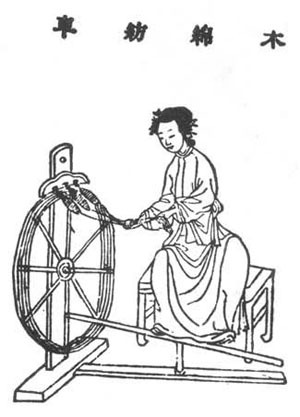 The textile machine in China originates from the spindle wheel in the Neolithic Age (xīn shí qì shí dài 新石器时代). 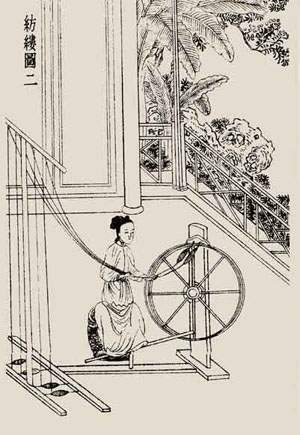 In the Western Zhou (xī hàn 西汉) Dynasty there came into being the spinning wheel (fǎng chē 纺车) which is with the traditional capability. 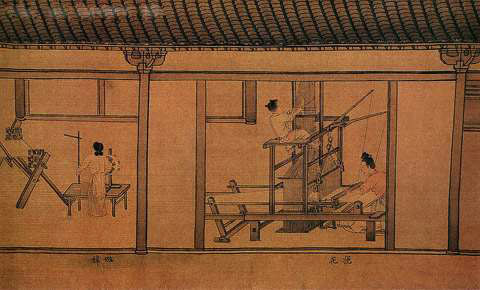 In the Han Dynasty (hàn cháo 汉朝), the jacquard machines were widely used. After Tang Dynasty (tang cháo 唐朝), the textile machines were improved, and greatly promoted the development of textile industry. The development of textile technology is depended on textile material. Therefore, the material of textile is of great importance in the textile technology. In late years of the Song Dynasty and the early years of the Yuan Dynasty (yuán cháo 元朝), Huang Daopo (huáng dào pó 黄道婆) had learnt from the Li people (lí zú rén 黎族人) a series of techniques of planting as well as cotton spinning and weaving. She also popularized and improved many textile machines so that the efficiency of labor was greatly increased. 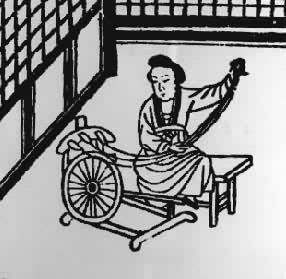 She improved on the cotton fluffer and successively invented a tool for cotton-spinning, a pedal spinning wheel with three spindles (sān ding jiǎo tà fǎng mián chē 三锭脚踏纺棉车), which was the most advanced one at that time. In ancient China, besides wool, cotton and flax, people also used silk for textile. Silk is the best textile fibers which can be weaved into various complicated tracery. The widely use of the silk has also greatly promoted the textile techniques and textile machines. Thereby, the silk production technique has become the most representative in ancient China.